Do you know the most powerful way to market your book? It’s a free, highly credible, highly viral resource that helps to amplify your efforts to create interest and buzz about your work. And all you really need for word of mouth marketing is a book worthy of sharing, and a way to get it into the hands of the people who will spread the word. Well it is simple, but not necessarily easy. The devil is in the details, right? Although the concept is simple, the implementation is going to require some time and effort, especially in the beginning. However, with a good plan, you’ll soon reach a tipping point where your fans begin to market for you in numbers great enough to really impact your book sales. The best time to design and implement your marketing plan of action is before you even start writing your book. It takes time to build relationships, learn your readers wants and needs and develop a base of rabid fans that clamour for more. Grow your readership as you write your book, and when it’s time to launch your baby, you’ll already have an invested and eager audience waiting. Great advice, except my book is already written. Now what? So, let’s skip past the year or two (or five) of blood, sweat and tears that were required for you to pound out, edit and polish your masterful novel, and assume that it is indeed worthy of personal recommendation. Focus more on discoverability rather than selling. Your work is important, so help those who can benefit from it, find it. Accept responsibility for the marketing and promotion of your book. Even if you choose to outsource some of the work, your book’s success depends on you taking action. Marketing and promotion is just an extension of your author platform. The lines between platform building and book marketing are often blurred. 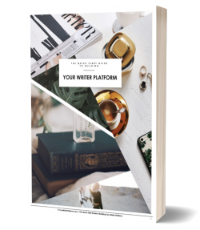 For the biggest impact, combine these 71 strategies with the 101 Quick Actions You Can Take Today to Build the Writer Platform of Your Dreams. 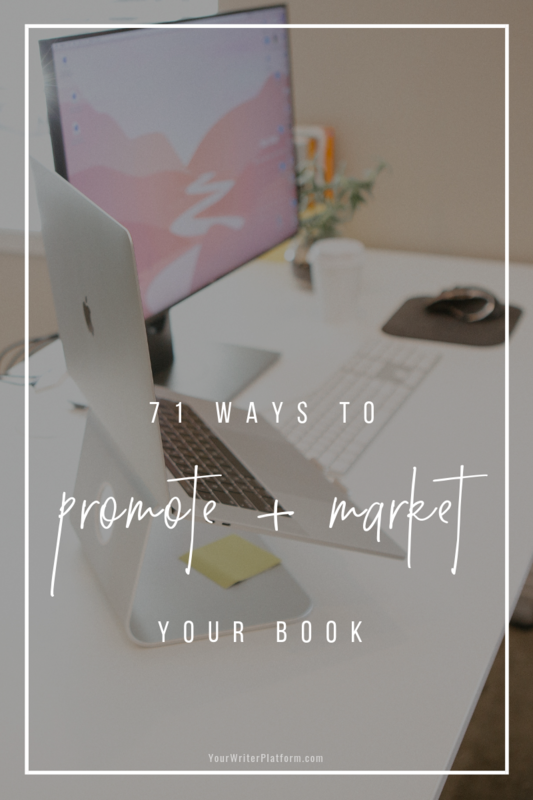 What follows is a list of 71 tactics to add to your book marketing arsenal. Not every strategy will work for every author, so pick and choose what makes sense, adapt what you can, and after you’ve gone through the list, you may come up with some of your own marketing ideas to implement. 2. Establish a budget. How much money are you able and willing to spend marketing and promoting your book? Include everything from paid advertising to travel costs. 3. Create a marketing plan. Don’t skip this step! How much time can you devote to establishing and maintaining your book promotion strategies? What marketing tactics do you intend on implementing first? What are your goals and how will you measure them? 4. Get creative. Use your book’s theme, location, or time period for inspiration and making marketing connections. A character’s hobbies, occupation, lifestyle, values and interests can be jumping off points for developing promotional strategies. Brainstorm (with Google), companies, experts, businesses, organizations or groups that you can approach for joint marketing ventures. 5. Tell your author brand story. Write an author biography that succinctly defines your reason for being; keep it to two or three short but memorable paragraphs that will resonate with your readers. Show some personality and give your readers a reason to care. 6. Create your hook. Having trouble summarizing 40,000+ words into a few, attention grabbing sentences? Here’s a couple of resources to get the creative juices flowing: Think Fast! 10 Minutes to the Perfect Elevator Pitch and Writing Loglines That Sell. 7. Build your email list. Invite people to subscribe, and make it worth their while by providing remarkable content. Use your list wisely to create and build buzz for your launch. Engage your tribe early, keep them ‘in-the-loop’, and ask for feedback so they become invested in the successful outcome of your book or project. 8. Make it easy to buy. Ensure your author website includes book links that are clear, easy to find, and go directly to your listing at every retailer you’re listed with (Amazon, Smashwords, B & N, Kobo, or Apple iBookstore). 9. Link your book to trending topics. Write articles that tie your book topic or genre to current popular interests. 10. Schedule social media. Decide when and what you will share on your social media platforms. Optimize your profile on Twitter, Facebook, Google+, LinkedIn, Goodreads and Pinterest. Select the most effective time for reaching the most people with Tweriod, Sprout Social or Buffer. 11. Promote your ebook for free. Here’s a list of free sites from Mediabistro. 12. Set up online book giveaways via Goodreads. Or try a member giveaway at LibraryThing. 13. Time your release. Time the announcement of your new book with an important, relevant news event, blockbuster movie or trade show. 14. Create a readers guide at the end of your book. Use your book’s description to let people know that your book contains a helpful discussion guide at the end. 15. Learn some copywriting principles. Marketing isn’t just storytelling. It’s also about getting your readers to take action. Hone your copywriting and content marketing skills and turn your audience into book buyers. 16. Host and record author hangouts on Google+. Not sure how? Try this comprehensive post on demystifying Google+ hangouts from The Future of Ink. 17. Think outside the ‘box’. Gain marketing information and insights from outside the writing industry that you can tweak and apply to your book marketing strategy (music industry, small business start-ups). 18. Get a professional and distinctive author photo. Use this image across all your social media profiles, on your site, at the end of your book (along with your author bio) and on your print materials. 19. Create a press release. A good press release will include the information needed for a reporter or blogger to understand the news value of your story. Make sure it’s clear what you are announcing, why the reader of the press release should care, and where they can get more info if they’re interested. Then submit your press release to free press release distribution sites. 20. Get media savvy. Develop a relationship with local media, including radio, newspaper and tv connections. Find an angle that hooks reporters and will benefit their readers or viewers. Pitch articles, interviews and relevant blog posts. Here’s an awesome post by Patrick Garmoe at Copyblogger to help you out: 109 Ways to Make Your Business Irresistible to the Media. 21. Read marketing, blogging and social media roundup posts. Save time! Take advantage of resources provided by other bloggers and writers that scour the web for you, and dish up the best of the best around the web. Try Kristi Hines’ Fetching Friday on Kikolani.com, or The 21 Best News Roundups for Self-Publishing Authors at Reedsy. 22. Guest post frequently and strategically. Guest blogging is one the best ways to increase visibility, gain influence in your genre or topic and draw targeted readers to your online ‘bookstore’ or author site. 23. Get early/pre-release reviews. At least three months prior to publication, make a list of book bloggers and reviewers in your book’s genre, read their guidelines on what and how to submit, and start sending your manuscript out for early reviews. 24. Create bookmarks. Old school, but still effective. Include an image of your book cover, your hook or logline, as well as your website and contact info. If you think your audience will understand and use a QR code, include one on your bookmark or other print materials. Check out How to Create a QR Code in 4 Easy Steps by Corey Eridon at Hubspot. 25. Be friendly. Introduce yourself and get to know the owners and staff at local, independent bookstores. Contact genre experts and well known book review blogger sites. Who do you know? Who do you need to know? Step outside your comfort zone and devise a plan to reach out to these people. 26. Tempt your readers with more. Insert sample chapters from the next book in a series at the end of your current book to pull your readers in. 27. Understand Amazon’s system and use it to your advantage. Use categories to streamline and increase discoverability. Test out your new copywriting skills and create . For more help with your Amazon descriptions, try Author Marketing Club’s . 28. Write a series. Obviously this won’t work for every author or book, but when possible, creating a series is a very powerful and effective way to develop a presence, gain reader loyalty and boost sales of earlier works with subsequent novels. For more on this, read Jonathan Gunson’s ‘Series’ – The Single Most Effective Career Strategy A Writer Can Employ. 29. Advertise your previous works in each book you publish. One of the best places to advertise your previous work is at the end of your current book, where you’ve got a happy reader, eager for more. 30. Create a promo kit. Include graphics, images, links, excerpts, and sample Facebook shares and Tweets, that can be sent to bloggers upon request. 31. Participate in a podcast tour. Do some research to find author friendly podcasts, or use your connections to create your own podcast tour. 32. Attend live networking events, conferences and expos. Attend, or write a proposal to present at an event, to gain connections, increase you credibility and develop a supportive network of influencers. 33. Update your email signature. For every email you send, ensure that you include info on your new or upcoming book and a link back to your blog or book website. 34. Develop a workshop based on your books content. Especially for non-fiction writers, teaching your book’s content can further solidify your expertise in the minds of your readers and your peers. 36. Design a launch strategy that works. Your book launch requires a lot more prep and strategy than several Tweets and a beseeching email to friends and family. Plan a party, launch at a unique venue that relates to your book’s content or team up with other authors announcing their new release to heighten the excitement across several author platforms and audiences. Here’s a great post via Firepole Marketing on book launch strategy. 37. Sign up for the Amazon Affiliate Program. Add to your income by earning fees on all qualified purchases through your affiliate link (not just on your books). 38. Add a ‘contact the author’ section at the end of your book. Give details on how readers can connect with you via email, your author website or through social media. 39. Writing is your business. Make sure your on and offline presence (website, social media profiles, print materials) is professional and doesn’t portray a hobbyist. If you’re not committed, neither will your readers be. 40. Submit your article to a link roundup. If you are creating exceptional content on your author blog (you are, right? ), then make a list of related, popular blogs that do link roundups (like #21 above, but in your topic or genre) and submit your article. It may not always be accepted, but when it is, you will get a back link as well as an influx of high quality visitors to your site. 41. Participate in or organize a virtual blog tour, blog hop or sharing contest. For a description of the pros and cons of each–and what to expect–read this post by Donna Brown at Molly-Greene.com: Author Promotion: Blog Tours, Hops & Sharing Contests. 42. Create urgency. Use time-limited coupons, giveaways and contests. Host a contest on your website. Offer bonuses or special extras to readers who purchase your book prior to a certain date. 43. Join forces with local merchants. Team up with store owners and other businesses to offer certificates, prizes and merchant coupons to be shared or given away during your book promotions. (Advertise these perks on your site and on printed materials). 44. Time and coordinate promotions. Try to time your guest posts, author interviews, giveaways, advertising and other promotions to run at the same time, so that each promotion gains momentum from the other. The perception of ‘being everywhere’ will strengthen your chances of creating the word of mouth marketing momentum we’re looking for. 45. Become a subject matter expert. Even if you’re a fiction writer, you can still tie concepts in your book to topics that require expert opinion. 46. Don’t stop promoting one book to start writing another. The buzz and excitement of a launch can be exhilarating, but the marketing and promotional effort for a book must continue far beyond the initial days and weeks of ‘getting it out there’. Include in your marketing plan a schedule that allows for ongoing promotional activities of your previous work, while providing time to write your next bestseller as well. 47. Try Fiverr. Find some quality gigs that will submit your book to free websites, submit your press releases or have someone (relevant) share your most recent–and fascinating–blog post. 48. Do book readings or author visits live or via Skype. Try schools, your local bookstore, library or community college. Get people interested before you get there: create a packet that gives a summary of what to expect during your visit, printed materials like a flyer and book order form (that can be photocopied) or other promotional materials (like bookmarks). 49. Connect with your readers offline. Gain exposure through book signings, book clubs, writing groups, school visits, workshops, library readings and local area meet-ups. For tips on book signings, check out JA Konrath’s post on Book Signings: Everything You Need to Know. 51. Take it further with video. Record your readings and share on your YouTube channel, Facebook Page, Google+ and on Goodreads. 52. Promote others. As you help promote other authors in your genre, by sharing their blog posts, reviewing their books and the like, you will build good will and a strong network of peer support for your current and future projects. 53. Create a Bit.ly vanity URL for your book. Bit.ly is a link shortening service that can also give you stats on the number of clicks on your link and where it was shared. Use Bit.ly to create a link that is easily shareable (not super long or a jumble of letters and numbers) for your book. Here’s a video how-to. 54. Purchase advertising. Set up a Google Adwords account, or try Facebook or blog ads. Other advertising options include sites like BookBub or EReader News Today. 55. ‘Free’ sells. Giving away your work for free is controversial, but often free now can mean increased sales down the road. Freebies might include free chapters, free signed copies of your book or other giveaways. 56. Add a Hellobar book teaser to the top of your author website. 57. Create a virtual bundle. Package together a print book and ebook, an ebook and course, or an ebook with videos and a workbook to add more value and options for your reader when purchasing your work. 58. Encourage your fans to market your book. Your fans can earn a little extra income by enrolling in Amazon’s or Smashword’s affiliate programs and adding links to your books on their websites or blogs. 59. Repurpose content and reach more people. Take your popular posts, useful insights, inspirational quotes, noteworthy results, chapter outlines or key points and repurpose them to share as a presentation on Slideshare or short videos on YouTube. 60. Slideshare. You can embed your presentation on your site (or others can embed it on their site), and you can embed YouTube videos–including your book trailer–into your Slideshare slides. Remember to add hyperlinks so viewers can get in touch or visit your author website. 61. Rock your book trailer. Show your creativity, humour (if appropriate) and personality. Try to avoid the jacket-flap blurb over a photo montage, and consider incorporating your overall message and brand. If you don’t feel you have the skills to create a book trailer that steals the show, you can hire a company to make one for you–just do a little cost analysis first to see if the marketing benefits outweigh the price tag. 62. ‘Consign’ your book. Consider trying a consignment style approach in gift shops, specialty stores, boutiques and galleries. The store owners may not want to purchase your books outright, but may display and sell them in their store for a cut of the profits. 63. Partner up. One of the best things about being a writer is that your only true competition is yourself. There are no ‘winners’, just insatiable readers that will devour a book in hours that took you a year or more to write. Use your connections or develop new ones to help cross promote with other authors, illustrators, musicians, designers, experts, events, charities, interest groups and so on. 64. Sell some ‘merch’. Give your fans the opportunity to promote you and your work offline by creating and selling themed merchandise on your site. 65. Use Vine. Vine is an app that allows you to make short video loops, and forces you to get to the heart of your message quickly. Fun to make and easy to share, your Vine videos can include a myriad of images and behind-the-scence glimpses of your writing process, your brand or even your personality. 66. Donate. Build goodwill (and good Karma 🙂 ) by getting your book into the hands of people that might not normally have access to your work. Considering donating your book to hospitals, shelters, churches, libraries, doctor/dental offices, hair salons, organizations or clubs. 67. Back of room sales. Promote your work when giving lectures, speeches, and teaching at workshops. Have a selection of your books with you and available for purchase. 69. Have a Google+ online launch party. Use your new Google+ hangout skills to set up an online launch party for your book, or for the launch of several books by authors in a related genre. As an example, here’s a press release for an online book launch party. 70. Reconnect with your University Alumni. Your university, college or even high school can be a great resource. Notify your alumni of any upcoming events, check to see if they have a listing of alumni books (so you can add yours), and ensure that they are on your press release distribution list. You can even offer to do a presentation for faculty or the students. 71. Have fun! Take a moment to breathe, and realize that not everything on this list needs to be done today. Concentrate on the first three steps so you can frame your marketing strategy moving forward, then add tasks and tactics as you have the time and attention to do so. Enjoy it! You are finding ways to get your work noticed and shared by hundreds, maybe thousands of people who will then share it with even more. Go, word of mouth marketing! For those of you who have already begun your book marketing and promotion, what strategies have you received the most return on? What tactics were a complete flop? Any advice you would care to share with those writers who are just beginning their journey? And for those of you just starting out, what part of the promotional process are you finding the most difficult? Please share in the comments below. This is an excellent “To Do” List. I have tried some of the things that you have suggested. I know that i have not gone far enough. As some people say, the hard work begins once the writing is finished. So glad you found this list useful, Victoria! What are some of the things you’ve tried, and what were your results? I find the tricky part is to find that line between working at something long enough to see results, and walking away from a strategy that just won’t give you the return you need. Kimberly, another blockbuster post. Awesome and much appreciated for the work that goes into putting this kind of content together. As far as #51, do you have any plans to add video to your blog? And yes, I am working on getting video up on my site. I have two posts currently that include video-so I’ve dipped my toe in a little-but I really need to carve out some time to ‘batch produce’ some more. Thanks for taking the time to stop by, Joel! I appreciate the kind words and your support. A round of guest posting is next on my to-do list, so please expect a gentle tap on your email door real soon! #47 promoting through fiverr is interesting. I didn’t think of paying someone to do a blog post. #42 create urgency I’ve tried with my ESL book. I made some coupons on Smashwords and put the codes on the book’s page on my ESL website, as well as in a blog post on the site. They were valid for 2 weeks, no bites. #37 use Amazon Affiliates. I gave this a try, and was making a nice draft blog post when the email came in saying my site was not what they wanted. Perhaps it was a lack of visitors, or perhaps the heavy influence of Smashwords. #33 update email signature. I’ve tried this one, but I’m not sure there’s any way to measure the results. #29 I promote books in the back of my book all the time. #28 I’ve written 2 series, so I have that going for me. #27 I thoroughly enjoy trying to figure out the beast that is Amazon. #19 create a press release. I did this with my history book. I sent it out to all the leading newspapers of the state and then figured out it had a typo. I felt real silly. Thank you for sharing your experiences, Greg! I love hearing what other authors are doing to promote their work. As for the Amazon Affiliate Program, check out their Associates Program Operating Agreement. It does mention a few states that are ineligible to participate in the program, so perhaps that was the problem. If not, it also says you can reapply at anytime. Who is your ideal reader, Greg? Make sure your marketing and promotional efforts are designed for them. Find out where they are and what they’re looking for–then be there and provide it. Hi Kimberley, great post. I’m working on the outline of my first book (reading your book). Guess this is the right time to start implementing some of these actions. I like #4, about marketing to the characters occupation environment, that’s a great idea! Thanks, Magda! And you’re right, now is the perfect time to get started; both with your platform building and your marketing. One of the biggest advantages you can give yourself is understanding your readers (or potential readers) so well, that finding connections between them and your writing is easy. Try a little brainstorming or mind mapping for your work in progress, Magda, and you’ll be surprised at how many tie-ins you can come up with! Thanks for the outstanding page. I have read many of these suggestions, but not all and never all in the same place. I released my first YA novel in a series last week. I am already on top of some of the ideas listed. I actually am using a successful self-published author’s blog as a guideline for what I should have on my blog to use it as a website for my books. That is how I found out about the Amazon Associates Program, but I don’t think I am ready for that because I am not able to give them some of the information they ask for on the sign-up page. Do you have any advice on when I should sign-up for the Associates Program? My blog is not officially “live” yet. Thank you for creating this valuable information. I can’t wait to start trying some of the ideas listed. Wow! Congrats on the release of your YA novel, Sarah! That’s so exciting! And it sounds like you’re off to a good start with your marketing. One suggestion would be to use not just one successful, self-pub author’s blog for a guideline, but several. Like 10 to 15. That way you’ll get a better feel for the key elements that work, and more inspiration for helping your blog standout. (Here’s a post that might also help: 11 Author Website Must Have Elements. Don’t worry too much about the Amazon associates program; it’s a bonus, not a necessity. Your Amazon Author Page is a bigger deal. Good luck on your book and your series, Sarah! And always review books you enjoy. That’s right, Dotti. It never hurts to support your fellow writers! Thanks Kim for yet, another informative article on author platform building! It’s jam packed with actionable tips and ideas to sky rocket as an indie author. My only thing is finding the time, lol. I feel like taking your Fiverr suggestion further with getting pros from there to do more marketing tasks for my author brand. There’s only so many hours in the day and one can easily lose their energetic spark to write creatively if a lion’s share of the day is spent towards marketing. What do you think about the idea of, INDIE AUTHOR: CEO of TEAM AUTHOR GREATNESS? You are so welcome, CJ! And I am totally with you on the mini task force that’s required to take advantage of all the opportunities that are available to writers today. But until I can figure out how to make some, my current strategy is to just try and prioritize. It’s easy to get distracted by all the things we can do to build our platform and promote our work, but the key is to figure out what we should do; and it’s not the same for every author, or even every book. When you map out your marketing plan, incorporate those promotional elements that (based on your research) you feel will deliver the most impact. Don’t try to include every tactic, just the ones that will give you the best ROI. Tweak and refine your strategies, toss what isn’t working and add new tactics when you’re ready. If you have the opportunity (and the cash reserves) to outsource, choose things that don’t require your authorpreneurial vision. That is, those things that are repetitive, technical or require skills you don’t possess. Just keep in mind that it’s always your reputation and brand on the line. Again (broken record here), this is NOT going to happen overnight. That’s why it’s so important to start your platform building and marketing efforts as soon as you can, so that you don’t feel the pressure of trying to set everything in motion after you’ve released your book. Great ideas! I look forward to trying them out! I don’t have a book to promote, but if I did, I’d definitely be using this post, Kimberley. Many of your points work very nicely for promoting anything really – a blog, product, service, etc. And you are right about this list working for promotion in general. The theory is the same, whether you’re marketing a book or a blender; you must find a way to get your ‘product’ noticed by the people who will value it highly and tell others. Thanks again for including me in your Marketing Skinny, Ana! Plus I’m always happy to share excellent resources with my readers! Kimberley — wowzaa! Every single time I swing by, I’m so glad I did. I’m just wrapping up my second book which I feel like is an achievement but it’d be great to have someone besides my mom and husband raving. 🙂 Thanks for your generous ideas! Glad to share, Juleee! And thanks for stopping by (again 🙂 ). I’m sure your Mom and husband have reason to rave, so good luck on creating your marketing plan of action, and sell some books! wow what an exhaustive list! i can see how a lot of these steps would help even with my free ebook. Love the idea of the blog hop too. Thanks, Gary! I appreciate the compliments! Wow, Kim, another epic post! I’m definitely bookmarking this one. Wait . . . I think I may have said that about all your posts! Thanks so much for all these terrific ideas! An author friend sent this through to me. I’m so glad she did! My book is currently a work in progress – recounting tales of my life at a game lodge in Africa. What I found has worked quite well is joining various FB groups, not mentioning the book straight away, but contributing to posts and comments, posting photographs of wildlife and so on, and then mentioning the book when a ‘following’ has been established. I have achieved more interest with this approach than with things like Twitter – building a follower base there is not so easy. Your 71 Ways … has been an eye-opener for me – thanks for the time and trouble you put into it to helps us struggling authors who often feel totally alone and lost, knowing they’ve produced something readable, but having no idea how to tell the world. I will be implementing a large number of your ideas. Thanks Again. Thank your author friend for me too, Brian! I know exactly how you feel, and it’s why I developed this site. There is no reason why this information should be so hard to come by for writers, so I’m glad authors are sharing it with each other. Not every item on the list will work for every author or book, but it should give you a lot to work with. Hopefully it will spark even more creative ideas that can be shared. Great list! I can’t wait to get out there and try these! Thanks for the ideas! Completely agree with you, James! Knowing your ideal reader and starting ‘yesterday’ are two major advantages you can give yourself when designing your book marketing strategy. Smart move with the models, too. I’ve seen that concept work well for children’s book authors: while promoting their work, the illustrator markets your book throughout their network as well! Kimberly, thanks for all the tips on marketing and promotion of books. You listed some ideas that I was unaware of and I will be using these ideas in the future. Hi Kim, I wasn’t expecting my book to be accepted by Authorhouse, as I have just arrived in the UK. I wrote it out of boredom, whilst waiting for work. I have NO knowledge of bookstores, media, Radio stations and where to start. The book comes out in 4 weeks, all 3000 copies. I really am drained at the moment, as I don’t have a clue what to do anymore! Authorhouse is what’s known as a ‘vanity or subsidy press’, Sally. You pay a fee to have your book published and usually get little help with distribution, book marketing or publicity. Traditional publishers pay you, not the other way around, so what you are actually doing is self-publishing your book. You’ll need to do some research, so here’s a few resources to get you started: How to Publish a Book 101 and Is Exploiting Self-Publishing Authors to Be the New Publishing Model? 1) Don’t panic! 😉 Building a platform takes time, and it’s impossible to do everything all at once. Sit down and make a plan as to what you would like to do prior to the launch of your book, during the launch, and after. Prioritize and keep it simple – it’s better to do a few things well, then to scatter your resources and have nothing really make an impact. 2) Set up your online home base: Set up your website, develop your ‘author brand’ and start making connections on 1 to 2 social media platforms. 3) Define your target audience: who is your book for? What are their interests and where can they be found, online and off? Everything is about increasing exposure. The more the better. That’s why I choose to use all the available free sites. Interesting, Tania. What kind of results are you getting by having this service submit your ebook? Yikes! Thanks for all the tips, they will come in very useful next month when my book is out there. Sounds like yes writing was the easy part. I was thinking to start to self publish on Amazon? What are your thoughts on self publishing? I think self-publishing is a fantastic opportunity for writers, but you have to do your homework and make sure you know what you’re getting yourself into. Independent publishing is a business, so you need to approach it as such. It’s not easier, simpler or cheaper, but it is a very viable and rewarding opportunity for those willing to put in the effort. Joanna Penn (TheCreativePenn.com) is an excellent example of a ‘hybrid’ author making both traditional and self-publishing work for her. Really interesting material here. Before now, I’ve been a purist: an author’s book lives or dies on merit, not on marketing. But in our world, I realize, that’s short-sighted. As I follow my book on Amazon’s Author Central, I’m wanting to do more to get my book out there. Getting my book noticed is my task–then it can success on its merit. Even the best marketing can’t make a bad book good, Evelyn, so your first order of business is to create something of quality. But without readers who can discern the relative value of your work -without an audience to share, critique, evaluate and propagate your book- it’s ‘merit’ remains undiscovered. So, you’re right, success as a writer is to create something of real value and find a way to get it noticed by the people who will appreciate it’s merits. Excellent advice! I do have a question, though: My novel is releasing in June, 2014 – and I’m having my website overhauled right now. I’ve just received the cover copy for the book and the web designer wants to feature it on the site. It’s too early for a “pre-order” button, and I worry it’s too early to post the cover . I’m thinking of your point about creating urgency. Will people tire of seeing my cover and not being able to even pre-order? Or will it help build interest. Is it ever too early to promote? Thank you! What’s important though is that you use the cover release strategically and build as much momentum as you can before your book launch. Talk to your web designer (and publisher) about ways that you can tantalize or peak the interest of your readers. For example, maybe you can use portions of the cover in your graphics, so people don’t get to see the whole thing until before your book launch. Or maybe you can incorporate your cover into a banner graphic that adds to the mood of the cover/book theme, with text that states ‘coming June, 2014’. Do a little brainstorming to see how you can first build up the release of the cover, then use that momentum to keep the excitement high for your book launch. Once you have your cover ‘out’, include it in all of your promotions and advertising, including offline marketing like book marks and postcards. Get to know local booksellers and librarians, so that you have a relationship (or at least a familiarity) with them prior to your publication date. Good luck, Rebecca! Hope this helps! Kim – thank you so much! That is great advice and i will definitely sit down to work out the strategy! I’ve been stressing over this question and was so glad to find your website! Thank you for your blog and your answer! I’m feeling much more confident! Kim, what an excellent article. I am currently marketing my children’s Christmas book, Carrie Cardinal, and am so excited to use these great suggestions. I think it is wonderful you took the time to make such an amazing list. I am very impressed, and very grateful! Great post. It is thousands of articles summed up in one nice package. I like it! I have tried to sell and promote my two books via “amazon” and no one ordered my books. In Israel I have received very positive critic. Please see short synopsis on the books: Is it possible to sell the books with your help? The first book is a bilingual; Hebrew and English, Historical roman, based on warrior diary, written during the six day war. The second book is a botanical, bilingual book, Hard cover with 250 colored pictures, describes all eucalyptus species (171), growing in Israel. It is a field guide required by botanists, ecologists, beekeepers and foresters. I will appreciate your prompt answer. Sincerely yours. Dr. Y. Reves. I don’t offer any promotional or marketing services, although if you do a bit of online research, you may find some businesses that do offer these services to authors for a fee. What I provide currently, Yehuda, is tips and resources on how writers can create their own marketing and promotional plans. This is great. HarperCollins just picked up my self-published book and I need to start promoting for my May 2014 release. Thanks for the tips. What works better is leaving a useful or thought provoking comment that compels other readers of the site (and the site owner) to want to click on your name to find out more about you – and your book. Beautiful list with original content. Another one I’d add is to always have a few copies wherever you go. Thanks, Keith! And good point on toting around some extra copies of your work – you never know when and opportunity will present itself. Happy to help, Paul! Good luck with your first book! Great ideas and tips! We thought so highly about this that we just posted a link about this to our over 7000 friends on Facebook! Thanks for sharing! You should add http://www.oneshotpitch.com I’ve just started using that and it has been great so far. I just joined your site. Thanks for the information on book promotion. I am a self published author since late September. I am still learning the ropes, book promotion is something i know nothing about. Your information is very helpful. I look forward in reading and applying your information. If you are struggling with something, or need a bit of guidance, let me know; I’d be happy to help if I can. I am grateful for you taking the time to put this list together. It is very helpful. I have finished my first self-published book and all of the information here is very helpful. I prayed about it and found what I needed to be on my way. Thank you so much! This is my first time visit to your site and you are providing such a vast amount of information. Thank you so much. I will be going through your 71 ways to improve the exposure and sales of my books. Sounds good, David! Good luck! This might sound trivial, but if your book is published and you have an ISBN you can also list your book on product databases for more exposure (if it doesn’t exist in these databases already). Thank you kindly for sharing your marketing plan with us. It is comprehensive, insightful, perceptive, professional and will prove to be helpful to authors over and over. Keep up your good work! Great blog. Very inspiring. I am a Dutch writer and my 10th (!) book comes out next month. I can tell you: promoting and marketing is so important and it literally never stops. I am always looking for new ideas and your website is a great source of exciting strategies. Thank you for that! Your 10th book, Judith?! Holy smokes, that’s fantastic! Thanks for sharing your insights about book marketing and promotion–I 100% agree. I’m so glad that you’re finding new tips and ideas here to help keep your momentum going. This is THE best info I’ve found online! I just finished my first novel and expect it to be available in a month or so…I will ne doing alot of my own marketing and this site will be a fantastic resourse f9r me! Thanks so much! Excellent list, Kimberley. A real find for me today. I have co-authored /edited several history books produced by my publishing company and recently released my first work of fiction, a novel about a time travelling, slave owning cotton plantation owner. I am working on a marketing strategy and was happy to find your article within a few minutes of my in-line research. I plan to read all the comments too.